Seriously... my 4 year old is IN LOVE with this game!! It's so funny to see him play along with me. He tries to get me to fall over. This game isn't like the traditional twister. It's a bit of a mixture between Just Dance and Twister! Cause that's really what you're doing. Dancing. NOT very gracefully in my house, that's for sure! lol. There are already great tunes included, but you can plug in your tunes and rock your own spots with those too! This TWISTER DANCE game combines today's hottest dance songs with the iconic TWISTER spots. Multiple dance levels and beat detection technology provide a progressive, exciting and contemporary dance experience. 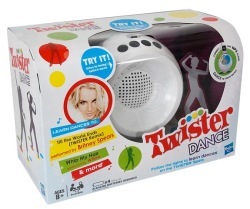 TWISTER DANCE console comes loaded with 5 pre-programmed songs performed by top artists. Dance to the exclusive TWISTER REMIX of "Till the World Ends" performed by Britney Spears, "Whip My Hair" performed by Willow, "We R Who We R" performed by Ke$ha, and "Cupid Shuffle" performed by Cupid. Also, watch Britney Spears perform new dance moves created just for TWISTER DANCE on RocktheSpots.com!